Learn about the Beat generation, the Barbary Coast and San Francisco’s Italian community on this 2-hour historical walking tour in North Beach, including admission to the Beat Museum. Led by a local guide, you’ll hear the stories behind the neighborhood’s coffee shops, jazz clubs and speakeasies. Pass Vesuvio, a favorite drinking spot of the Beats, as well as City Lights Bookstore, Kerouac Alley and 1010 Montgomery. Then head to the Beat Museum to see memorabilia from Allen Ginsberg and other big-time writers. Meet your guide and group in Kerouac Alley, in San Francisco's North Beach neighborhood, to begin your cultural underground tour. This is where the writers, artists and visionaries of the Beat Generation movement frequently congregated during the 1950s. Walk through the area's streets and hidden landmarks to learn about the lives and times of the people who made up this movement, such as the iconic Jack Kerouac, author of 'On the Road'. Hear stories about the Barbary Coast's Gold Rush days, when the area was filled with sailors getting 'shanghaied'. Learn about the Italian anarchists who settled in the neighborhood and the circumstances that allowed strip clubs, gay bars, drag shows and the punk movement of the 1980s to thrive and prosper here. The Beat movement's tolerance, rejection of censorship, experimental drug use and environmental awareness paved the way for the vibrant neighborhood that exists there today. Stroll past a secret underground tunnel and some historical speakeasies on the way to the City Lights Bookstore, co-founded by Lawrence Ferlinghetti, a longtime San Francisco resident. Learn about the bookstore's history, particularly its role in Alan Ginsberg's public readings of 'Howl and Other Poems' and the resulting obscenity trial. Stop in at Vesuvio, a bar frequented by the Beats, that is still popular with the locals today. Check out The Cellar, an influential poetry and jazz club, as well as 1010 Montgomery, a place several members of the Beats called home. Finish your 2-hour cultural tour at Washington Square Park. 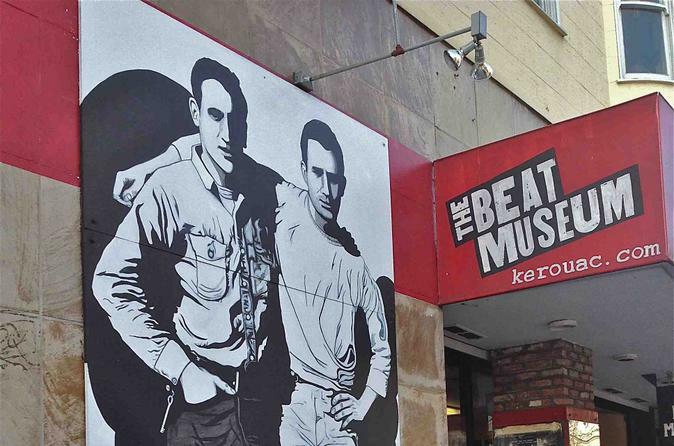 Admission to the Beat Museum is included after the tour.